Once referred to in a review of his work as “The Smartest Cartoonist on Earth”, Chris Ware is an internationally known and award winning artist, writer and graphic novelist. The title was a spin on his book, Jimmy Corrigan: The Smartest Kid on Earth, which was published in 2000 to enormous acclaim and was recently selected as one of the 100 best books of the decade by the London Times. 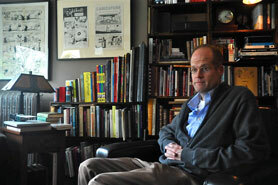 His recent work, Building Stories, was named to multiple lists of the top ten books of 2012. Ware is also known for his series of comics entitled the Acme Novelty Library and is a regular contributor to the The New Yorker (iconic covers) and the first cartoonist to serialize an ongoing story, “The Funny Pages” in The New York Times Magazine. His art is said to reflect early 20th century American styles of cartooning and graphic design, shifting through formats from traditional comic panels to faux advertisements to cut-out toys. Stylistic influences apparent in his work include advertising graphics from that same era. Ware resides in Oak Park with his wife Marnie--a high school science and art teacher--and their daughter, Clara. His love of history is evident in the 1906 shingle/ arts and crafts home he lovingly restored to the period and filled with historic Oak Park memorabilia and items from iconic Chicago architect Louis Sullivan. Click here to download a PDF of the key Chris Ware made for the art posters he created for the Historical Society.